Apple’s AirPrint technology in the iPhone, iPod touch and iPad makes it easy to send photos and documents stored on those devices directly to nearby printers via a local Wi- Fi network, eliminating the need to send these files to a computer first. But it won’t work with printers that aren’t specifically labeled AirPrint-compatible, which practically limits its utility; if you’ve wanted to use AirPrint, you’ve probably had to buy a new printer. 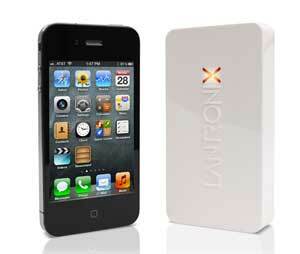 This week at the International Consumer Electronics Show in Las Vegas, however, Lantronix, Inc., debuted a better option: a small device named xPrintServer-Network Edition ($149.95) that plugs into a home network router and makes almost any old printer compatible with the direct printing capability built into Apple’s iOS devices––as long as that printer is also connected to the same router, either by a cable or wirelessly. No other installation steps are required (there are no additional applications, software downloads or printer drivers requires), and the xPrintServer will automatically discoverall the compatible networked printers in the vicinity. But the xPrintServer will run only on iOS version 4.2 or later, and it won’t work with every printer ever made. Right now, the xPrintServer is compatible with “thousands of printer models” from HP, Brother, Canon, Dell, Epson, Lexmark and Xerox, Lantronix says, although downloadable updates to the device expected later will add even more printers. The xPrintServer is slated to be available in the first quarter of this year at Amazon.com, NewEgg.com, Buy.com, and MacMall.com. In addition, pre-orders can be placed now at the company’s website. Watch the Lantronix xPrintServer launch video to learn more. RU serious. I wouldn’t pay $150 for this device. I can buy a new laser printer for that amount.